Pick Analysis: Toledo's 2016 first-team All-Mac tight end did not have it easy growing up. His father spent time in jail, and he was suspended from elementary school a few times until it was discovered he had a speech impediment and attention deficit disorder. Once that was under control, Roberts did well in high school, though his grades prevented him from receiving a scholarship. He also lost his grandmother to cancer and a younger brother to an accidental shooting. Roberts made his own way as a college student at Toledo, eventually getting eligible to play for the Golden Rockets. He played in five games as a reserve in 2013 (no catches) and nine contests the next year, seeing a bit more playing time (4-65, two TD). Coaches began relying on him in his junior year, starting him once in 12 games (21-234, four TD). As a senior, Roberts became quarterback Logan Woodside's favorite red zone target, scoring 16 times (sixth-most in the FBS) on 45 receptions that covered 533 yards. 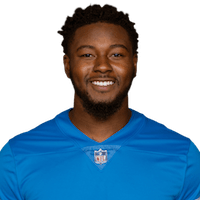 Published: April 29, 2017 at 01:17 p.m.
Former Detroit Lions wide receiver Herman Moore announces the Detroit Lions' selection of Toledo tight end Michael Robert in Round 4 with the No. 127 overall pick in the 2017 NFL Draft. Published: March 30, 2017 at 09:18 p.m.
Toledo Rockets tight end Michael Roberts goes through workouts at the 2017 NFL Scouting Combine.